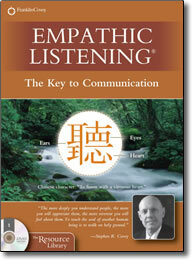 Empathetic Listening DVD with Stephen R. Covey – Free Preview – Save! Most people don’t take the necessary time and effort to properly diagnose a problem before prescribing solutions. They immediately assume they understand the other person’s condition. Often the biggest obstacle in interpersonal communication is the tendency to respond autobiographically–meaning from our own frame of reference. Empathetic listening is reflecting what a person feels and says in your own words. It is NOT listening to advise, counsel, probe, judge, question or analyze. Empathetic Listening is to the heart what air is to the body. This complete presentation package contains everything you need to effectively teach the principle and practice of Empathetic Listening to your team.